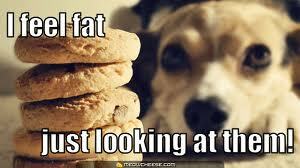 Don’t you hate those “I feel fat” days? I know I’m not fat. I know I didn’t gain 50 pounds overnight. And yet…. Where did this mentality of “I feel fat” come from and become socially acceptable? Have you ever noticed that when you get together with your girlfriends, the conversation often drifts to “I feel fat” or “I need to lose some weight”? Isn’t the phrase “I feel fat” just a veiled “I don’t like myself or my body” statement? For years my mom harped on me about something called negative self-talk. It was kind of abstract for me when I was a teenager and it really didn’t resonate with me. Her telling me to stop the negative self-talk didn’t DO anything, I didn’t change my thinking. When I was slowly (sometimes painfully so) losing my weight, I was grasping at straws to stay positive. I knew that if I let that negative voice creep into my mind, I’d go off the rails and return to my old habits. For me, food was an emotional crutch. This time around, I did not want to fail. I had a goal I wanted to reach, losing weight was a necessity, failing was NOT an option. So what did I do? I faked it til I made it. I told myself I was happy, I WOULD lose the weight, I WOULD reach goal, I would not fail. Even if I didn’t really believe it yet, I told myself those things and eventually I did start to believe them! The “I feel fat” voice in my head was slowly disappearing. It was being replaced with the “Oh my god, I lost more weight!” voice that made me feel happy and encouraged. For the first time, I understood what my mom meant about negative self-talk. For so many years I’d been telling myself I would always be fat, I couldn’t lose weight, etc etc and that kept me from even TRYING. Why try? I already knew I was going to fail at it! But was that the truth? Was that the voice I should be listening to? No. It’s kind of a “If you keep on doing what you’ve always done, you’ll keep on getting what you’ve always got” notion. So why aren’t we trying? Recently I had a return of the “I feel fat” feelings. I stopped and asked myself: What am I REALLY feeling? I was feeling stressed. I was feeling overwhelmed. I was feeling tired. I was feeling guilty for eating too much Halloween candy. Final thoughts: Wear clothing that makes you feel good (too baggy isn’t good, or too tight either!). Keep doing what works, stop doing what doesn’t. Change the behavior, change the negative voice. Fake it til you make it. I needed that reminder recently! OMG, such a great post! I struggle with this EVERY DAY. I love the “what am I REALLY feeling” question, I’m adopting that immediately! You are right about wearing clothes that fit properly too. If I’m slopping around in sweatpants and one of my husbands huge t-shirts… well, I feel sloppy and huge. Losing weight can be such a struggle, but if your mind is in the right place, it’s easier to focus on the end goal. Thank you for the comment, Lisa. I like how you said “if your mind is in the right place, it’s easier to focus on the end goal.” It’s so so true. Wow. LIghtbulb! I never thought of it that way but I think you’re right. WHen I have “fat” days it’s days when I just don’t like how I look. Fat = disgusting to society and instead of saying “I feel ugly today” which I think is mostly associated with my facial appearance, saying “I feel fat” means you feel ugly in your body and that your face is ok. ?? does that make a lick of sense? I think you’re right to squelch the statement, too. It’s nothing but negative self talk/image and in order to be healthy mentally you need to love yourself and not say hateful things. Awesome post! I think the “I feel fat” days are similar to the days where I want to stress eat. I’m clearly not hungry, don’t need the junk food, etc but the emotions I’m not facing or dealing with are masked as “hunger.” It’s all a mind game! Ugh! I hate days where I feel like this. Fake it till you make it is great advice. I usually remind myself that even though I’m feeling crappy today, tomorrow will inevitably be different…and to hang in there. Yes! Tomorrow is a new day! Even if we ate “Badly” today, tomorrow we can start over! I have those days. I am having one today. Yesterday my thighs didn’t touch as much as they do today… Did they? Well, they probably did, but I was in a good mood and didn’t notice. Or maybe the Chinese food from last night has bloated me. Or maybe a million other things could have happened. But none of it matters, coz my thighs feel bigger and that must mean I am fat… This is why I weigh everyday, to assure myself that I am fine! Your comment made me laugh! Even if you didn’t intend it to. 🙂 Isn’t it crazy how it can change from one day to another? Love this post. Sounds to me like your Mom is a very wise woman!!!! Have a great Thursday. This is such a great topic. I’ve found that through this process, I’ve had to change my thinking, too. I still have those days where I think I’ll never be able to finish this, but I also remind myself that that feeling is only temporary! Great post. YES! The feeling is temporary! Love this comment! YES! SO TRUE! When I have those “I feel fat” days it’s usually because I’ve been snacking on crap and then I feel bad OR I feel hormonal and “fat” and then I eat more as a result. It’s a vicious cycle. I hate those words: I feel fat. I think them sometimes and try to figure out what they really mean. Sometimes I feel bloated, so I try to drink more water. Othertimes, yeah, I’m sad about something, or I let somebody make me feel bad about myself (I say LET because people try all the time but I don’t have to let them.) 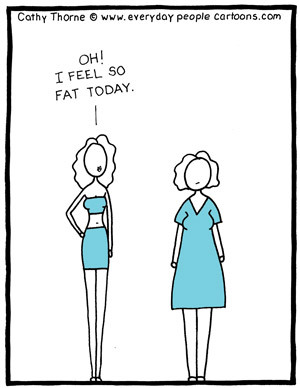 Either way, fat is definitely not a feeling! YES! We don’t have to let anyone make us feel badly about ourselves. We can choose to ignore it and know that we are awesome and confident.